So I took pity on him and decided to have a look through the cupboards to see what other fabulous ingredients I had…. Ok so some coconut, that will do the trick. I went to my fail safe cake recipe for this and swapped in the coconut and I used a coconut liquor, of course, you can leave this out and use vanilla essence or coconut if you can find it. This recipe is really easy, 225g of butter, sugar and flour, with 4 eggs, 1 tsp of baking powder and then the coconut and flavouring. I started by weighing the butter into a bowl and popping it into the microwave for 10 seconds to make sure it was nice and soft, whipped it little with the electric whisk, then added the sugar and whipped it until it was light and fluffy. Then I always add the first 2 eggs individually and whisk everything together in between each egg. Then with the 3rd egg and add a little of the flour mixture (flour and baking powder) whisk it again and then the 4th egg and the remaining flour mixture. Whisk it all together until it is just combined. 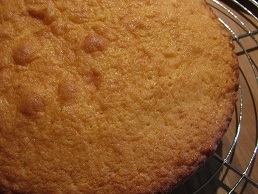 When pouring the batter into the cake tins, I weigh the tins and mixture, to ensure they are equal. It is usually in the region of 485-495g, it is all dependent on the weight of each of the eggs. I leveled the mixture into the tins and then popped them into the oven, 25 minutes later, I tested them with the trusty cocktail stick and they were perfect. So now it the hard part…. the waiting, I allowed them to cool in the tin for 5 minutes then I ran a sharp knife around the edge, just to make sure and popped them out and onto a cooling rack. Then it was time for the buttercream icing, I added the soft butter and icing sugar into a bowl and whisked until it was light and fluffy another shot of coconut liquor and it was ready. Then it was time for the kettle to boil and cut a nice slice and sit and enjoy…. Ideal for any day, but especially on a damp grey day. 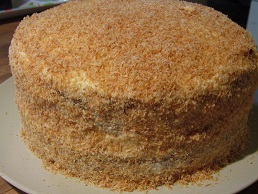 Luscious coconut layer cake, filled with buttercream and toasted coconut.... Simply delicious. Pre-heat the oven to 200c Conventional/180c Fan/Gas 6. Butter and line 2 x 8 inch (20 cm) cake tins. Weigh the butter into a bowl and pop in the microwave for 10 seconds to ensure it is soft. Whip the butter until it is soft and fluffy. Weigh the flour and baking powder into a bowl and mix together. Add the sugar to the butter in the bowl and whisk again until light and fluffy. Add 1 egg and whisk into the mixture, add the second egg and repeat. Then add the 3rd egg and a little of the flour mixture. Whisk again until just combined. Add the final egg and the remainder of the flour mixture, whisk again until just combined. Add the coconut liquor and the shredded coconut to the mixture and whisk again until it is all combined. Do not over mix. Divide the mixture between the 2 cake tins, I weight the mixture into the tins, to ensure I get 2 even layers, the eggs make the difference in the weight, 485-495g, in each tin. Place the tins in the oven and bake for 25 minutes. Check them with a toothpick to make sure the centre is done, before removing from the oven. Then remove them and allow them to cool slightly in the tins before removing them and transferring them to a cooling rack. I left them for 1 hr, to make sure they were cool enough for the buttercream filling. To make the buttercream filling, weigh the butter into a bowl and add the icing sugar and coconut liquor. Then whisk together with an electric whisk, and leave aside until the cakes are cool enough. To toast the coconut, lay a piece of grease proof paper onto a baking tray and spread the coconut out onto the tray. Place the tray in the oven and leave for 2 minutes, remove it and toss the mixture around, to ensure you achieve an even toasting. Place the tray back in the oven and check again after 2 minutes. I found that 4 minutes was enough. Remove the tray from the oven and allow to cool until needed. When the cakes are cold, remove the lining paper from the bottom of one of the layers and place it onto your serving plate. 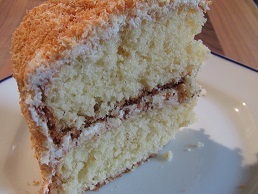 Take 1 3rd of the buttercream icing and top the bottom layer of the cake, sprinkle a little of the toasted coconut and then top with the other layer (after removing the lining paper, of course). Top the layer with 1 x 3rd of the icing and using the remaining 3rd, add it to the sides of the cake, a thin layer is all that is required, enough to allow the toasted coconut to stick to the sides. 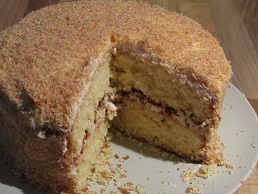 Sprinkle some of the toasted coconut onto the top of the cake and then placing some of the coconut in your hand, work it around the sides of the cake, until it is completely covered. Scoop up any that has landed on the plate and again work it around the sides of the cake. 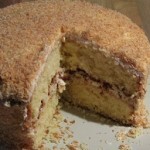 All that is left to do, is put the kettle on and enjoy a slice of cake with a cup of hot stuff.... tea of coffee. Take care with the coconut when it is in the oven, it will toast very quickly.